But I will—if I can! A round takes 45 minutes right now—the “plain round” just a little less—It's the same actually because after a 45 minute round, my hands begin to cramp up, and I need to take a 5 to 10 minute break. I just don't know how I'll feel latter—Likely fine—but maybe I just won't have 3 hours of daylight to knit 4 rounds. Here's an other close up of repeat—and clearly the base of the central eye motif is evident. The right half is still “stem”—but not for long—I'll be starting the stocking knit segment for this feather as I work the eye on the left feather. Which means, in addition to adding a bunch of stitches for the “eye”, there will be increases for the base of the right feather. 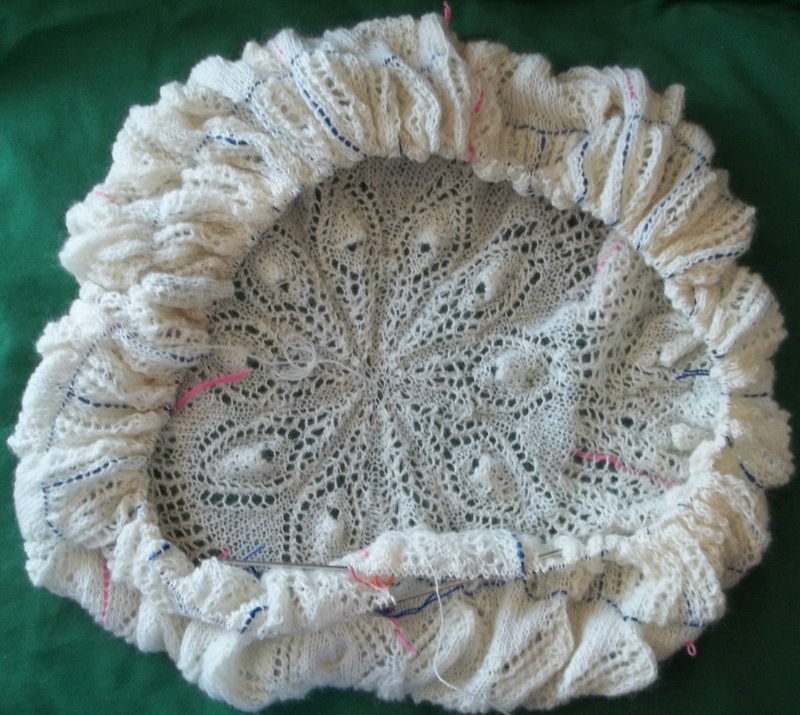 Here's what the shawl looks like—the near thousand stitches easily fit on the 40 inch needle. It doesn't look like much at all, does it? There is not a chance of spreading out much of the shawl—A complete spread is impossible even if I divided the work onto 2 or 3 needles. —the blue life line is smaller than the circumference and gathers the shawl in. But lightly stretched, (not hard blocked) its seems to be about 34 inch across right now. I am guessing finished it will be bigger than 48 inches—but not (likely) bigger than 60 inches. 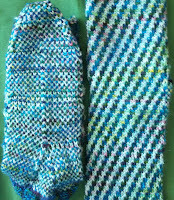 May's socks got worked on, too –see All Done! 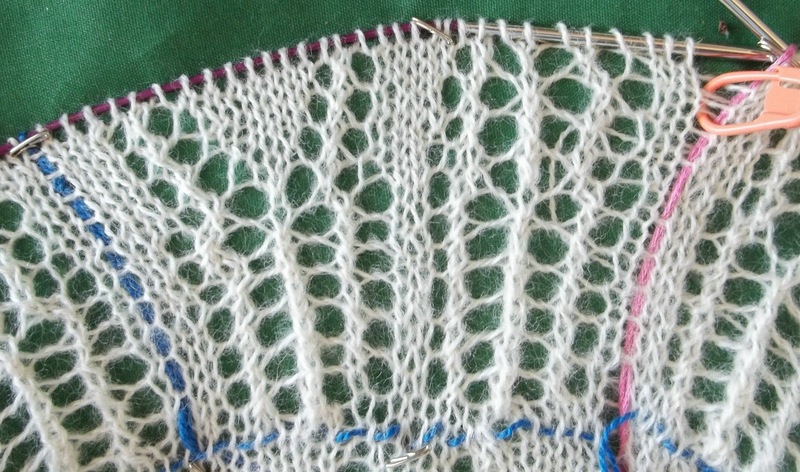 (but not finished—there are still ends to weave in)--here photographed flat—the change in gauge is, maybe, evident! 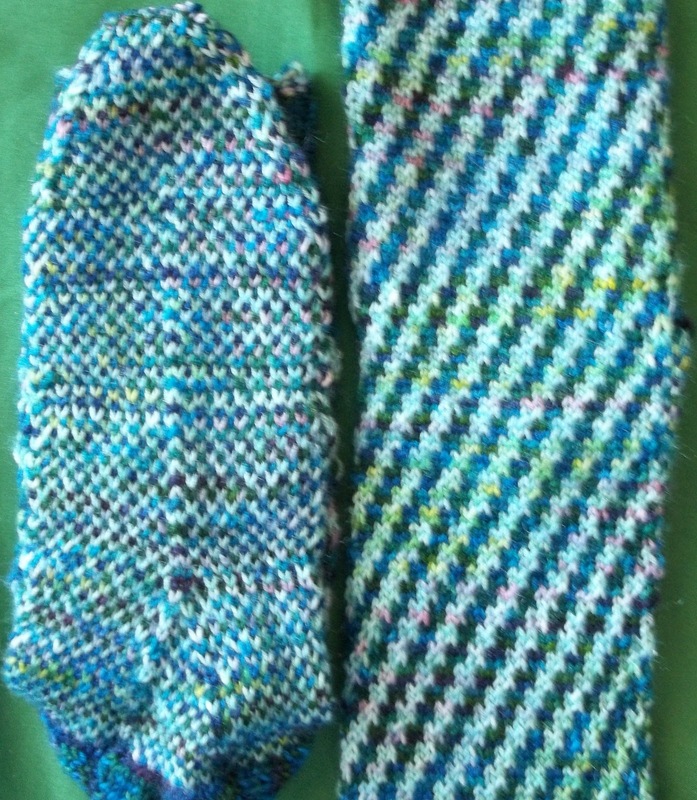 The leg is loose enough, and the socks easily go over my heels—so a snug, firmly knit foot is not a major issue. They aren't so tight as to be uncomfortable. Can you see the how, on the folded sock, the edges of the leg extend from underneath? It's really very obvious in person—but hard to photograph. 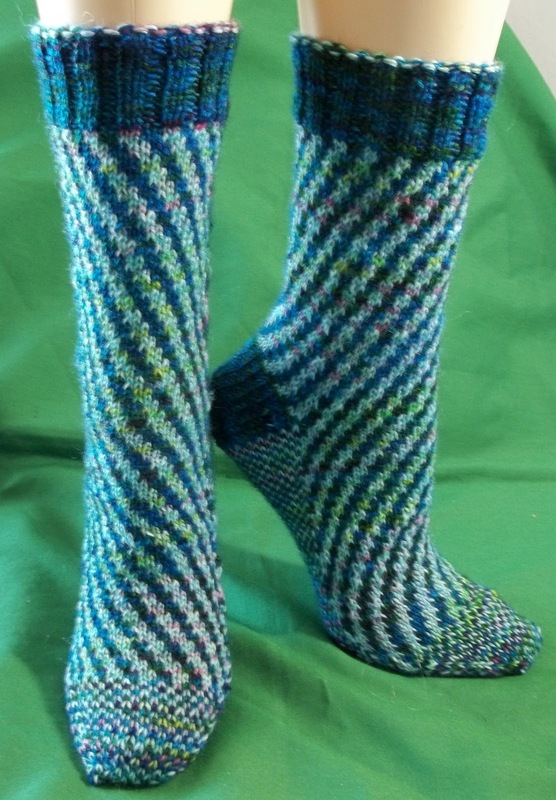 They fit LEGS perfectly—no ripples to try to hide!--Unlike most socks that are really too loose for LEGS. No sewing got done—The doctors appointment was fast and efficient (I didn't finish knitting the toes there, but at home late last night). Still--it was such a lovely day—I took a walk and loitered in the sun shine for a while on my way home. Last night, today's appointment time got “corrected”--from 8 AM to 10:30AM—much nicer not being part of rush hour on the subway. And a chance for me to take some photographs in good morning light—and get this posted. But with a three hour procedure, followed by another monogram (which technically is another procedure, in another floor/room (and wait) – can see this whole deal as taking up a good part of the day. I'm planning ahead and packing a light lunch—and a big bottle of water. That shawl is going to be beautiful!